“Katmandu” redirects here. For the song by Bob Seger, see Katmandu (song). The green, vegetated slopes that ring the Kathmandu metro area (light gray, image centre) include both forest reserves and national parks. Kathmandu (Nepali: काठमांडौ [kɑːʈʰmɑːɳɖuː]; Nepal Bhasa: येँ महानगरपालिका) is the capital and largest metropolitan city of Nepal. The city is the urban core of the Kathmandu Valley in the Himalayas, which also contains two sister cities namely Patan or Lalitpur, 5 kilometres (3.1 mi) to its southeast (an ancient city of fine arts and crafts) and Bhaktapur, 14 kilometres (8.7 mi) to its east (city of devotees). It is also acronymed as ‘KTM’ and named ‘tri-city’. Kathmandu valley is only slightly smaller than Singapore in terms of area. The city stands at an elevation of approximately 1,400 metres (4,600 ft) in the bowl-shaped valley in central Nepal surrounded by four major mountains, namely: Shivapuri, Phulchowki, Nagarjun and Chandragiri. It is inhabited by 949,486 (2009) people. The Kathmandu valley with its three districts including Kathmandu District accounts for a population density of only 97 per km2whereas Kathmandu metropolitan city has a density of 13,225 per km2. It is by far the largest urban agglomerate in Nepal, accounting for 20% of the urban population in an area of 5,067 hectares (12,520 acres) (50.67 square kilometres (19.56 sq mi)). 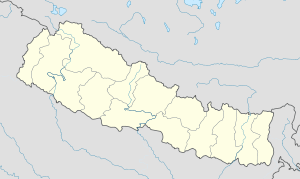 Kathmandu is not only the capital of the Federal Democratic Republic of Nepal but also the headquarters of the Central Region (Madhyamanchal) among the five development regions constituted by the 14 administrative zones of Nepal located at the central part of the country. The Central region has three zones namely, Bagmati, Narayani and Janakpur. 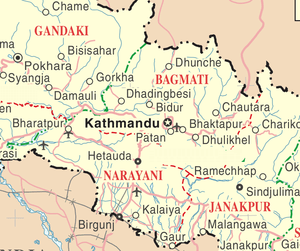 Kathmandu is located in theBagmati Zone. Kathmandu, as the gateway to Nepal Tourism, is the nerve centre of the country’s economy. With the most advanced infrastructure among urban areas in Nepal, Kathmandu’s economy is tourism centric accounting for 3.8% of the GDP in 1995–96 (had declined since then due to political unrest but has picked up again). The city’s rich history is nearly 2000 years old, as inferred from an inscription in the valley. Its religious affiliations are dominantlyHindu followed by Buddhism. People of other religious beliefs also live in Kathmandu giving it a cosmopolitan culture. Nepali is the common language of the city, though many speak the Nepal Bhasa Newari as it is the center of the Newar (meaning: citizens of Nepal) people and culture. English and Hindi are understood by all of the educated population of the city. Besides a significant number of the population speaks any of the foreign languages like : French, German, Chinese, Hebrew, Korean etc. The literacy rate is 98% in the city. Kathmandu is now the premier cultural and economic hub of Nepal and is considered to have the most advanced infrastructure among urban areas in Nepal. From the point of view of tourism, economy and cultural heritage, the sister cities of Patan(lalitpur) and Bhaktapur are integral to Kathmandu. Even the cultural heritage recognition under the World Heritage list of the UNESCOhas recognized all the monuments in the three urban agglomerates as one unit under the title “Kathmandu Valley–UNESCOWorld Heritage Site.